How Will the Boomer Generation Find Meaning in Retirement? 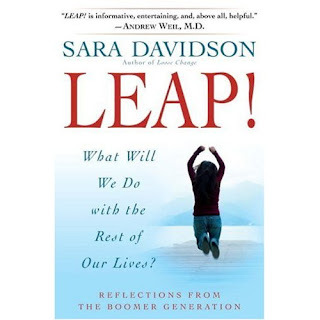 I recently read Sara Davidson's LEAP! : What Will We Do with the Rest of Our Lives?. The genesis of the book was an exploration of the author's own quest for meaning and substance in her work life as an aging Baby Boomer approaching retirement. The focus expanded to interviews with celebrity Boomers Carly Simon, Tom Hayden, supermodel Iman, Jane Fonda, Tracy Kidder and others. Davidson also interviewed teachers, business people and spiritual leaders. I was prepared to find this book over-indulgent and self-involved as are so many books about Baby Boomers (and it's my demographic!). But this book was a worthwhile read. Davidson very effectively balances her own journey with the experiences of her interviewees. She explores relationships with aging parents and adult children, serious illness, death and dying, ageism, sexuality, mental health and many important issues facing this generation. I was especially struck by the level of intimacy shared in both her and her subjects' personal revelations. At times while reading, however, it was hard to relate to people who are so well-off that they have no concept of the realities of serious financial concerns. These are not people who fear outliving their money. The easy access to comfort and security most of these subjects have is also not available to many people of the Boomer generation. The spiritual aspects of Davidson's quest reminded me of a favorite book, Po Bronson's What Should I Do with My Life? : The True Story of People Who Answered the Ultimate Question. I highly recommend this book to people of any age who are exploring their work lives. In both books, the creative process is an important theme. This spoke to me as a writer and artist. As a therapist, I find it helps patients heal when they begin to explore their creative selves. First reported in the western US states in January, 2007, candied methamphetamines (crystal meth) is the latest thing in street drugs. "Strawberry Quick" (photo: left) is one of many flavors on the street. Quick is reminiscent of the powdered milk flavoring, Quik and is sure to widen the appeal of the drug. It is not clear if the intent is to market the drug to children (it might be a way to combat the drug's bitter taste), but a "candied" version of a drug would certainly have that effect. In addition to its similarity to a popular milk flavoring, the candied meth is likened to a popular candy that fizzles in the mouth - Pop Rocks. "Drug traffickers are trying to lure in more customers, no matter what their age, by making the meth seem less dangerous." News of this version of a street drug prompted U.S. senators to introduce legislation in April that would dramatically increase criminal penalties for drug dealers who entice children with candy-flavored amphetamines or other flavored drugs. In light of this information, parents should be vigilant and remind children about taking candy, even from friends, when the source is not known. A recent PC hard drive crash prompted me to think about the Serenity Prayer. Like many well-known and often recited texts, most of us know it. But it’s so familiar, we forget about the actual meaning and intent. Most often associated with Alcoholics Anonymous and other 12-Step self-help groups, the Serenity Prayer is usually recited at the end of an AA meeting. As a chemical dependency counselor, I include it with the “toolbox” often used by newly–recovering people to maintain their sobriety. When my hard drive died, it took with it ten years of business and personal files and data. Like most people, I had not backed up my data. For several days, it was unclear if the data could be retrieved. To me, this fell in the category of total loss of control. Experts on stress say that most bad stress has a strong correlation to events in our lives over which we feel we have no control. So, how can the Serenity Prayer be used in stress management? Well, if we break it down, the first line is about loss of control - “accept the things I cannot change (control).” Traffic, the boss’s mood, illness, the weather, etc. are all things that are usually not within our control. The second line refers to things that we recognize as being within our control; things in our lives that we can impact – “courage to change the things I can.” Making changes does require courage! But it’s also very empowering. The third part of the Serenity Prayer exemplifies the key to managing our stress – “and wisdom to know the difference.” Realizing what aspects of our lives over which we have no control is a very hard lesson. Most of our stress arises from continually trying to control or impact those things that we have very little or no power to change. How did I apply this stress management tool to my recent PC disaster? I realized I had no control over the hard drive crashing. I did, however, recognize that I could try to impact the situation by finding a data recovery service to retrieve my data. They were able to retrieve about 90% of what I thought was lost. And I bought an external hard drive to back up my data! I've been inspired by problogger to write a list of the Top 5 Mind, Body, Spirit books at this time. This list is based on a combination of the Amazon best seller list and the New York Times best seller list. It seems that no one can get enough of this book and DVD claiming to hold the secrets to health, wealth and happiness. 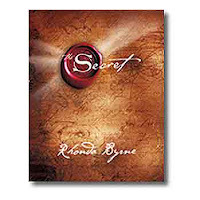 Rhonda Byrne has interviewed a number of self-help experts about the secret to success which they describe as the law of attraction. The book explains in simple terms the concept of the law of attraction and how you can apply this to your life to accomplish anything you desire including weight loss, wealth, success, love and happiness. This book has become an overnight phenomenon. 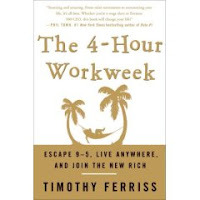 The author, Tim Ferriss, is a successful business entrepreneur who has disciplined himself to focus on the top priority tasks and to organise his work day to suit himself. He advocates conditioning your customers to be happy with your outputs, batching your work and reducing your availability so you can be successful in fewer hours and enjoy greater leisure. He also suggests automating as much as possible so that you can minimise your own inputs. A great concept! According to Dr. Timothy Brantley, most health problems are not caused by genetics or germs but by the standard American diet. According to The Cure the solution lies in flushing toxins out of the body, to restore balance, promote natural healing, and increase vitality. This is not an entirely new concept. The Liver Cleansing Diet by Sandra Cabot was based on similar principles. Timothy Brantley believes that his principles have helped him restore his own health and restore balance to his system. 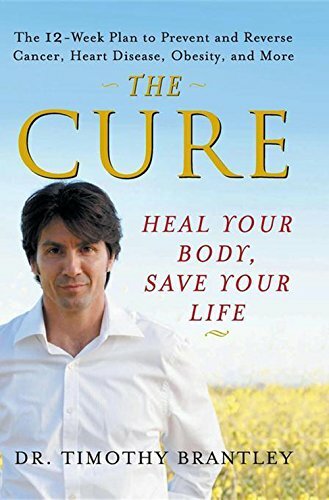 He believes that The Cure is also helpful for weight loss. As it advocates a mainly raw diet and water, this is hardly surprising. There are a number of books riding on the coat tails of the success of The Secret. The truth is that The Law of Attraction is not new and has been advocated by many self help experts including Brian Tracy, Bob Proctor, Tony Robbins, Earl Nightingale and Napolean Hill. In this book Michael Losier talks about how events that may appear to be synchronicity (or coincidence) are in fact a response to your energy vibrations. The solution to any problems in your life, therefore, lies in changing your vibrations to attract your desires. According to the reviews on Amazon this book very clearly lays out those principles and gives you step-by-step guidance to achieving your heart's desire. Yes, it's another diet book. 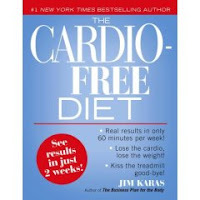 In this one, Jim Karas, trainer to media superstars such as Diane Sawyer, promises you will see results in just 2 weeks. He says, "not only does cardio fail to help you lose weight, but it kills -- it kills your time, your energy, your joints, and your motivation. You burn a few measly calories but then eat twice as many afterward. The result? Weight gain -- and lots of it." In this book he tells you how to exercise the right way in order to see incredible results.